Back in early December last year, we introduced a new feature in OpenSprinkler Firmware 2.1.1 that allows OpenSprinkler to directly talk to remote power sockets. With this feature, you can use OpenSprinkler to not only switch sprinkler valves, but also switch powerline devices such as light, pump, heater, fan. While it’s a powerful feature, it is after all a wireless solution so it’s not the most reliable — sending wireless signals to remote power sockets is prone to interference and is limited by distance and barriers (e.g. walls, floors) in between. 1. Omron G7L-2A-TUB-J-CB-AC24: this is available on Amazon. This is actually commonly used in sprinkler pump start relays — if you have a pump start relay, you can open it up and check if it has a 24V AC relay in side. This particular one has a contact rating of 25A @ 220VAC, which is sufficient for most applications. You can also find similar ones with different specifications: if you search for ‘Omron G7L-‘ you will find many choices, look for the ones ending with AC24, which are the 24V AC versions. I am quite curious how such 24V AC relays work. It probably is constructed somewhat differently from a DC relay. So I ventured to open it up. As you can see in the picture on the right above, it has a big coil, a contact piece connected via a spring. 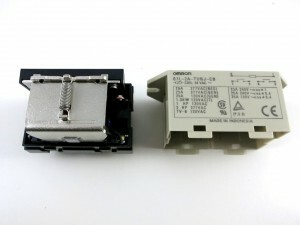 When voltage is applied on the coil, the contact piece gets attracted and therefore connecting two contact pins together. 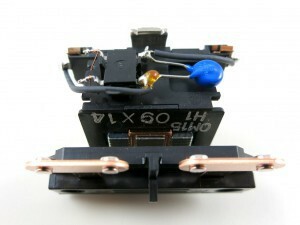 That’s how a basic relay works. Something strange I noticed is that when I try to measure the resistance on the coil, it gives me a very large value — several mega-ohms. The coil resistance can’t be that large. There is probably additional circuitry inside the relay. I then measured the forward voltage drop on the coil, at either polarity it gives about 1.25V drop, which strongly indicates there is a bridge (i.e. full-wave) rectifier inside. This makes sense, because a bridge rectifier is a standard way to convert AC to DC. 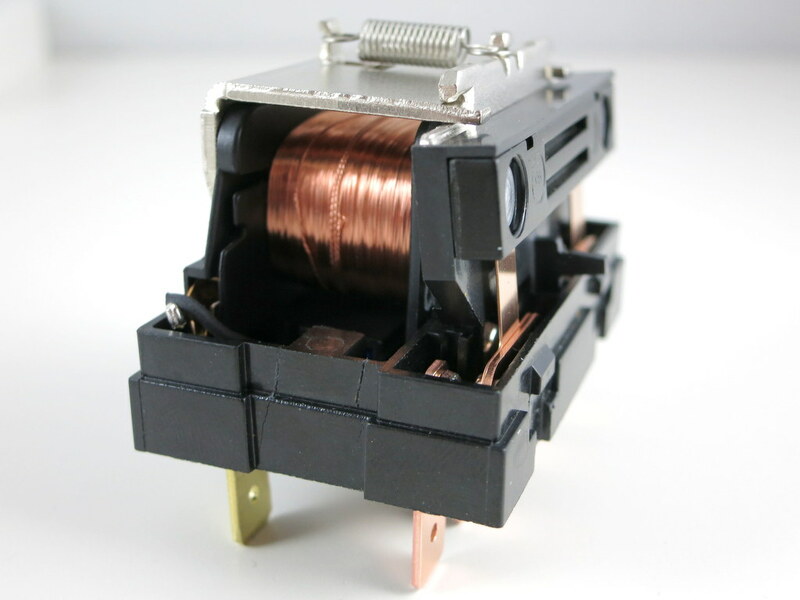 So the additional ‘construction’ inside the AC relay (compared to DC) is probably the rectifier. Yup, there is a bridge rectifier and a MOV. Previously I was measuring the resistance through the bridge rectifier, which explained why the value I got was incorrect. Now I can measure the real resistance of the coil, which turns out to be about 294 ohm. That’s about right — under 24V AC, it will draw an average of about 80 mA AC current, which matches the specification. 2. 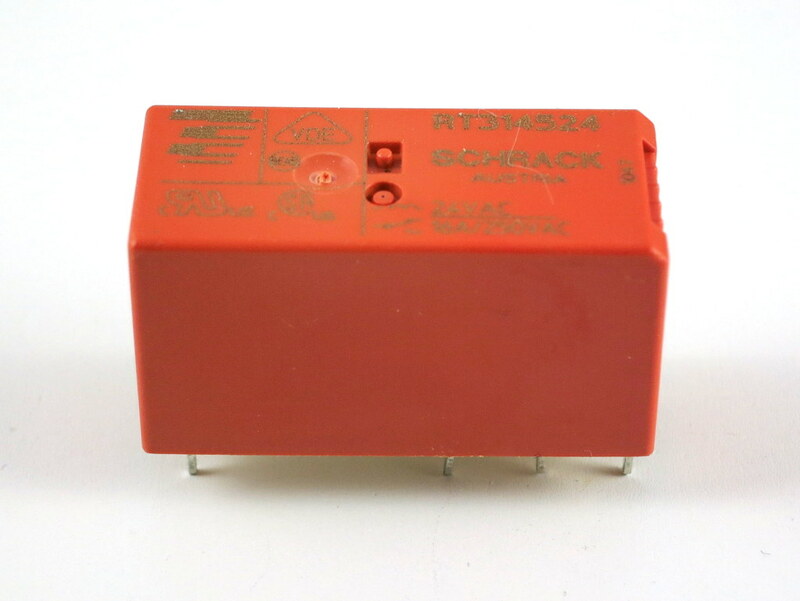 Schrack RT314524: This is a very small 24V AC relay that you can buy from Mouser or Digikey. It has a contact rating of 16A @ 250VAC, which is also plenty for common applications. 3. Other choices: There are some other choices which were brought up on the forum, including a open-style panel mount 24V AC relay, and even solid-state relays (SSRs). In any case, if you are looking for a relay to work with OpenSprinkler, the above are the ones worth considering. Thanks. I just received my DC powered OpenSprinkler and hooked it up to my solenoids and pump start relay. It has the same Omron part number as the one above. Before installing the system in the shed, I tested the unit in my kitchen with just the pump relay set up with a master on Circuit 8 and then played with the software testing the pre and post start master timing settings. It all worked fine. After installing it in the shed and also to the water zone solenoids I find the pump relay will “chatter” and audibly switch on and off a few times when the master is on. I’ve tried it with the pump as a load on the relay or not with the same issue, and also tried the pump relay and master on a different circuit. It seems as if there is not enough 24vac current to drive/latch the pump relay and the water zone solenoid, even though the pump relay should only draw about 70ma. Any suggestions? Do I need another 24vac really to drive my Omron relay with an additional more powerful 24VAC power supply? Since you have DC-powered OpenSprinkler, you should not use any 24VAC power supply — the way DC controller works is to simulate the behavior of solenoids but using DC-only voltage. It never outputs 24VAC, and it will be damaged if you feed 24VAC to it. Instead, you can try to increase the DC voltage — if you have a 9VDC or 12VDC power adapter, try them and see if it makes the pump start relay work better.